I hope you’re all having a fine day, so finally, I joined the Instagram world this morning, and I want to connect with all of you lovely bloggers. This a shout out to all the fine bloggers out there who are also part of socialing on Instagram and wish to connect. Join me, follow me and I shall follow you back. Take care and enjoy the rest of your day. 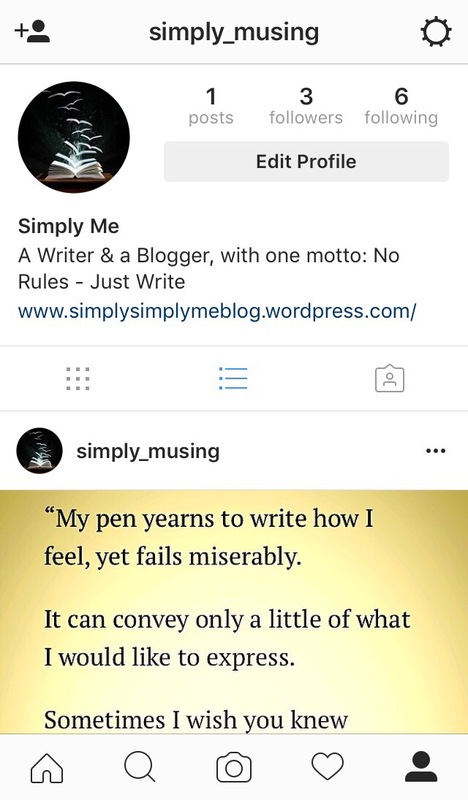 Welcome to my Simply Simply Me blog, The purpose and aim of this blog is to simply share my writings, day to day adventures and thoughts on varied subjects. I am a writer, a poet, yet I dream to be much more. I am just like you or any other intrigued or avid reader, writer with a life of ups and downs, highs and lows, yet continuing with a positive mindset to enjoy writing.